Recently I conducted an interview with Brazil’s very well respected stingless bee keeper Ailton Fontana. I asked him his story of how he got started and quizzed him about indigenous stingless bee keeping in Brazil. 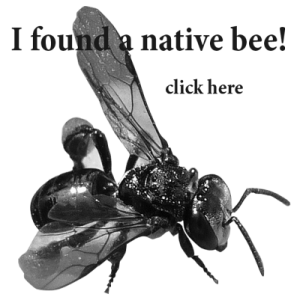 As a part of furthering knowledge, I wanted to interview people from other countries and get their take on stingless bees native to their homes and maybe learn a thing or two. 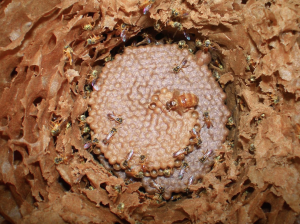 The people of Brazil have been keeping stingless bees in boxes many more years than us with a history dating back to the native Poudar people who kept stingless bees for the honey. Before I start, let’s look at just a few of Brazil’s favourite stingless bees. This bee is also known as the soldier bee. It has a team of protectors that hover out the front of the hive to catch any predators. 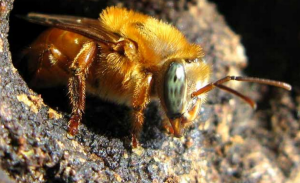 It is an aggressive bee that will attack any pests. There about 4 different types of Jatai. 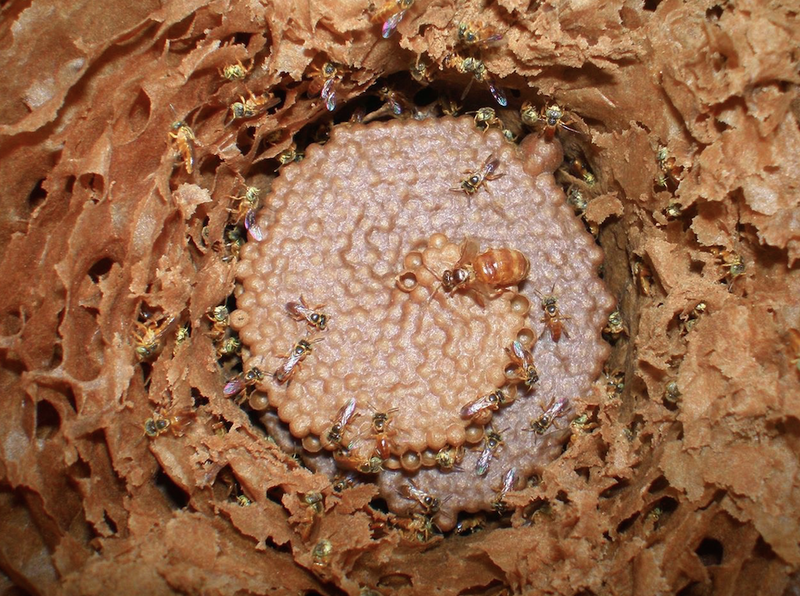 The bee uses a lot of cerumen in its hive construction and the brood is constructed in flat discs that are covered by an involucrum. They are a favorite to keep in Brazil because of their interesting appearance and behavior. How did your interest in bees get started Ailton? So. A part of my history. I have been a bee keeper for 30 years. I’m learned by accident. 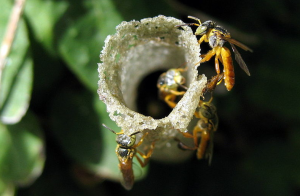 I was working in gardening and had never seen a bee hive box, or a colony. 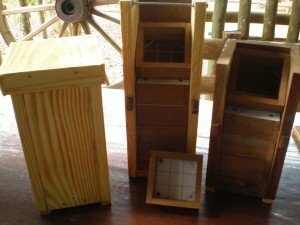 So, I founded a hive of Apis (honey bee) in a tree near the garden and, as i have already collected honey in a coconut tree and in a termite mound, I wasn’t afraid of the stings and i decicded to improvise a rustic box with no suitable measures. It worked and i got some pounds of honey. I then resolved to make something more suitable for the bees to live in. Visiting a neighbor to collect the default measures and some basic tips of handling, in 5 years I ended up with 300 hives! I can’t have this number anymore because the pesticides being sprayed prevent me from doing so. 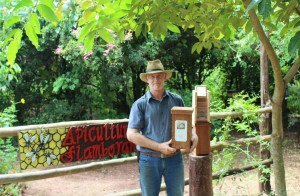 I always say that a good bee keeper always have a hive of Jataí to garnish his apiary and this one follow us for 30 years. Looking into one Ailton fontana’s Jatai hives. About 8 or 10 years ago, I don’t remember, a friend of mine (Wilson Gussoni) which lives in a neighbor city and i sometimes go out searching for adventure and he started to show me some species of bees of our region, explaining that would be good to keep them in box too. I already know them, but didn’t have any interest to keep them. One day, in one of my box traps for Apis , I founded a Uruçú Amarela “Yellow Uruçú” (Melipona mondory) and i was charmed. I transferred to a suitable box and henceforth I started to observe and capture other species in trap box’s too, turning it into a passion. Ailton Fontana preparing a bottle trap. The language is Portuguese so you will just have to watch and learn. 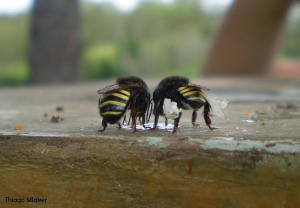 What are your top 3 favorite Brazilian bees? Today I have 25 species going very well. My favourite is Jataí to be more productive, rustic and they are in everywhere, but I can name others like Uruçú Amarela, Borá (Tetragona clavipes) and Marmelada (Frieseomelitta varia). The Uruçú Amarela is found everywhere here in the nature, was the first stingless bee I got. Borá, which have a unmistakeable smell, a wild smell. Anyway, we love them all. Tell me about your well known box design – how did it come about? About the hive box I’ve developed, we noted the old models, with no format and various measures. The Jataí didn’t develop very well compared the ones installed in bamboo or in 2 litres bottle of plastic PET. More production in a small box. I’ve made 6 types of hive boxes to find this one, which I believe that is for the bee keeper which lives in an apartment. 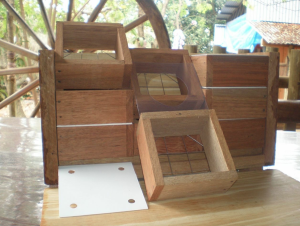 We had many difficulties in sharing the colonies and this model made the handling of stingless bees so easy. Ailton’s box allows the brood honey and pollen to be controlled by using separator sheets and small boxes. This can be useful when supporting another hive, doing a split of colonies or extracting honey. Quite cleaver. You can see Ailton Fontana building his very nice box in this video. 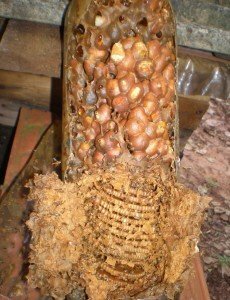 I sent Ailton some pictures of common hives here and asked how we can improve our splitting with our bees. Ailton with boxes in his garden. Here is Ailton’s reply. I left it how it was translated because I think its nice in its own right. I would like to wish that people which pretends to start to be a bee keeper, until “put your hands in the bees”, search for information in secure fonts, to miss as little as possible. Don’t primarily seek financial returns, but first, let’s preserve the species, making the right thing to do and we certainly will get the return pleasurable and financial. 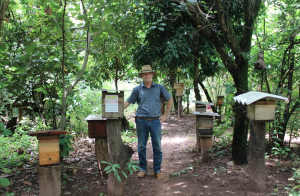 A very special thanks to Flavio from Brazil who is very passionate about stingless bees and has helped me translate this interview with Ailton. Flavio is apart of “SOS Resgate de Abelhas sem Ferrao” which is a group that was originally started to help save stingless bees. They now fight for many causes in Brazil. They donate many stingless be hives. 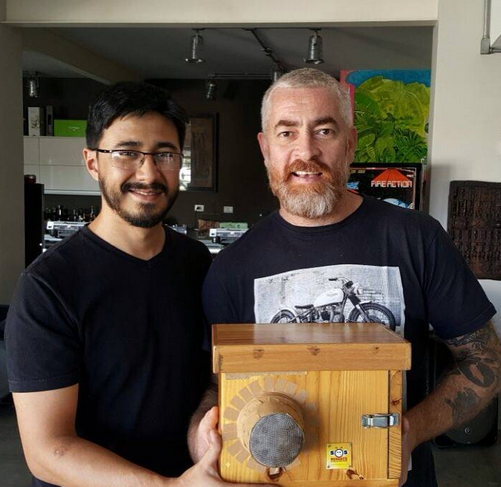 Here he is with Alex Atala, recognized chef who uses stingless bee honey in his dishes. 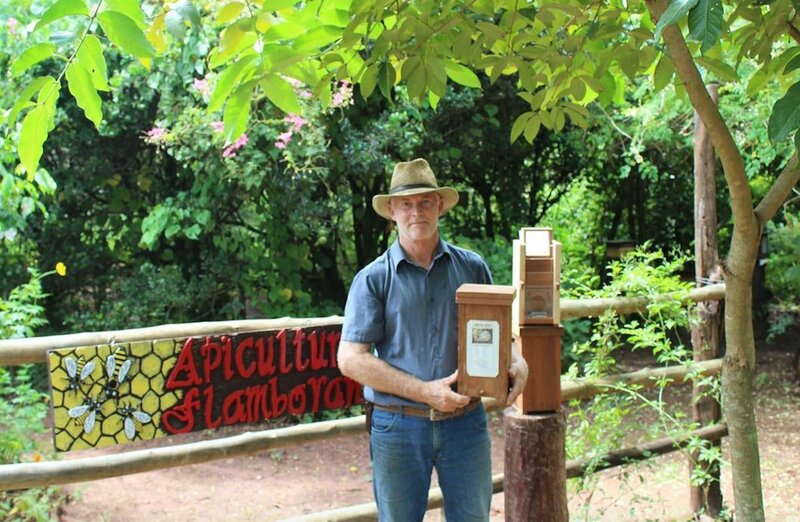 He is fighting for legalization of the sale of stingless bee honey in Brazil with his own institute, “the instituto Ata”. Flavio with Alex Atala, internationally renowned chef, receiving a bee hive Flavio gave to him. It was with great happiness that collaborated in the translation ( although I think my English is horrible ), but even happier to start building a good friendship with Nick . Yet I find an opportunity to visit Australia to meet the stingless bees of this place ! this is very interesting Nick, this shared information will help us all. Ailton Fontana is a great guy. He documents and publish everything he knows will be interesting to new and long-standing beekeepers. His passion is an inspiration to newcomers and his patience to respond to e-mails and questions on his youtube channel is unparalleled, not to mention his creativity. A true mentor. Thanks for making a comment all the way from Brazil Ricardo! I appreciate all help and comments from Brazil! We have much to learn from people like Ailton and yourself.